← Week 26 – finally a frost! Week 27 – last share of 2014! One butternut squash, one long pie pumpkin, shallots, Carola potatoes (up to 4 lbs! 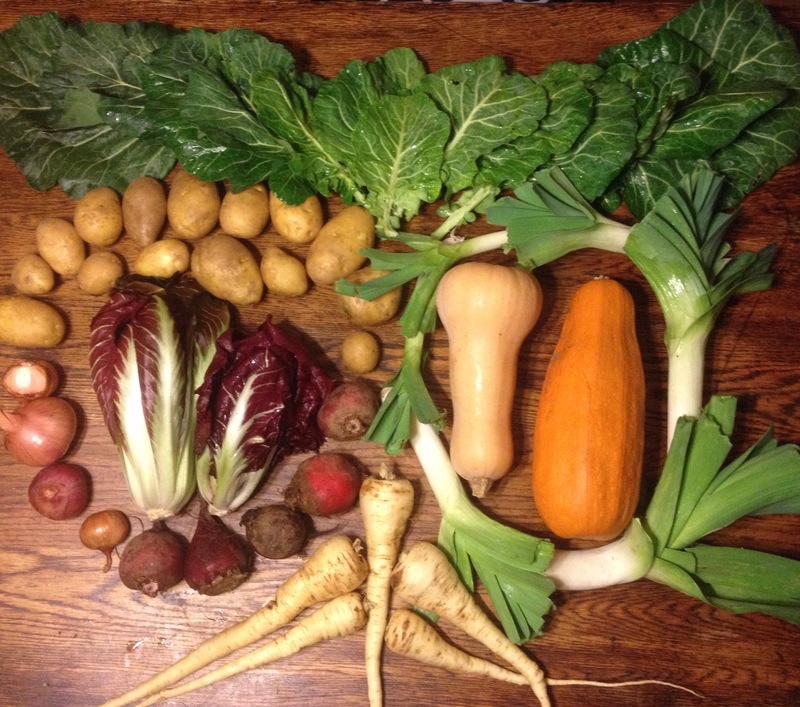 ), parsnips, beets, leeks, collard greens, and 2 heads of radicchio. The collards, leeks, and radicchio are the things that won’t keep as long as the rest if you are trying to figure out what to use up first. Butternut squash makes great soups and is also excellent roasted. In fact, roasting might be an easy thing to do with a lot of these items all together. I love making big trays of roasted vegetables this time of year. I cut parsnips beets potatoes winter squash onions and pretty much any other root veggie into similar sized chunks of about 3/4 inch, lay them on a baking sheet, toss with olive oil salt and pepper, and roast at 375-400 until all are tender; maybe checking and turning a few times along the way. This usually takes somewhere in the neighborhood of 40 minutes. Thanks everyone for a great CSA season! Thanks for all the great feedback over the year and I look forward to more. If you are interested in a share next year, please do let me know! I’m excited for a winter break, but I’m also excited to get back into planning mode, salivate over seed catalogs, and dream about the next abundant season of fresh neighborhood grown produce. Have a hearty happy Thanksgiving and a cozy winter!